Definition at line 49 of file BasicActions.h. Definition at line 27 of file Action.h. Definition at line 72 of file BasicActions.cc. 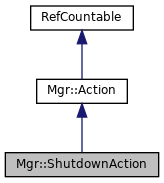 Reimplemented in Mgr::IntervalAction, Mgr::InfoAction, Mgr::CountersAction, DiskdAction, Mgr::ServiceTimesAction, Mgr::IoAction, Mgr::StoreIoAction, and SBufStatsAction. Definition at line 63 of file Action.cc. Reimplemented in Ssl::CertificateStorageAction, and Mgr::FunAction. Definition at line 64 of file Action.h. References Mgr::Action::atomic(), Mgr::Action::command(), Mgr::Action::createStoreEntry(), and Mgr::Action::name(). Definition at line 43 of file Action.cc. Referenced by Mgr::Action::aggregatable(), Mgr::FunAction::dump(), and Mgr::Action::fillEntry(). Referenced by Mgr::Action::respond(), and Mgr::Action::run(). Definition at line 36 of file Action.cc. References Mgr::Action::cmd, Must, and NULL. Referenced by Mgr::Action::aggregatable(), Mgr::Action::atomic(), Mgr::Action::createStoreEntry(), Mgr::Action::fillEntry(), and Mgr::Action::name(). Definition at line 73 of file Action.h. Definition at line 67 of file BasicActions.cc. Definition at line 55 of file Action.cc. References Mgr::Action::command(), Mgr::ActionParams::httpFlags, Mgr::ActionParams::httpMethod, Mgr::ActionParams::httpUri, Mgr::Command::params, storeCreateEntry(), and String::termedBuf(). Definition at line 78 of file BasicActions.cc. References DBG_CRITICAL, debugs, and shut_down(). Definition at line 99 of file Action.cc. References Mgr::Action::atomic(), StoreEntry::buffer(), Mgr::Action::command(), StoreEntry::complete(), Mgr::Action::contentType(), debugs, Mgr::Action::dump(), StoreEntry::flush(), Http::Message::header, HERE(), Mgr::ActionParams::httpOrigin, NULL, Mgr::Command::params, HttpHeader::putExt(), StoreEntry::replaceHttpReply(), Http::scOkay, HttpReply::setHeaders(), String::size(), squid_curtime, and String::termedBuf(). Definition at line 49 of file Action.cc. Definition at line 52 of file Action.h. Reimplemented in Mgr::InfoAction, and Mgr::FunAction. Definition at line 68 of file Action.cc. 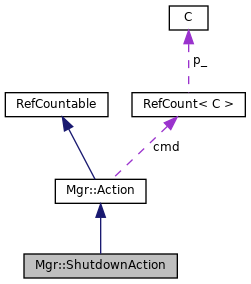 References Mgr::Action::collect(), Mgr::Request::conn, debugs, Comm::Connection::fd, HERE(), Ipc::Request::requestId, and Mgr::Action::sendResponse(). Definition at line 91 of file Action.cc. References Mgr::Action::collect(), debugs, Mgr::Action::fillEntry(), and HERE(). Definition at line 82 of file Action.cc. References Ipc::Port::CoordinatorAddr(), Mgr::Response::pack(), and Ipc::SendMessage(). Referenced by Mgr::Action::respond(), and Mgr::Action::unpack(). Definition at line 55 of file Action.h.